A little door opens in the clap of this bracelet of woven human hair to show a tiny daguerreotype of a young woman. Almost all Victorian human hair jewelry is described as "mourning jewelry" although we know that some were kept as a memento of a loved one. We do not know if this is a morning piece or just a keepsake of a beloved sister or daughter. 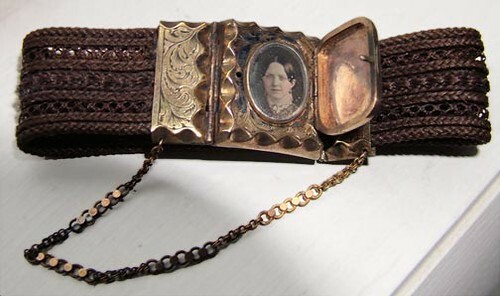 We have the same locket with a daguerreotype of a young man as the clasp on a black velvet ribbon chocker.